For people with mobility issues, getting up and out of a chair to manage simple tasks such as answering the door, going to the bathroom or preparing a meal may be difficult due to pain or lack of muscle strength for standing and sitting. Power lift chair recliners are an affordable and extremely beneficial mobility aid to seniors with arthritis or other issues that make it difficult or painful to rise out of a chair from a sitting position or to sit down from a standing position. Power lift chairs can provide a sense of independence and assist anyone with difficulty standing up. Lift chairs are well suited for watching television, sleeping, reading, or simply sitting back and relaxing. You can recline the chair with just the touch of a button. Electric lift chair recliners provide a smooth transition from recline to a standing position, making it ideal for persons who have difficulty getting into or out of a chair. If you find it difficult to sit down and stand up, you may end up in the same chair all day unless you have someone to help you. Or if you can’t get comfortable, you may end up staying in bed. A lift chair can provide health benefits, and help to maintain or regain independence, and are often recommended by health experts and occupational therapists. People who have recently had surgery, have a chronic illness, or have simply lost some of their mobility over time are prime candidates to use a lift chair. Lift chairs can help to provide enormous health benefits to those who are suffering from a wide range of medical conditions, including arthritis, asthma, circulation problems and back pain. For people who spend a lot of time in an armchair, the additional seating positions that a rise and recline lift chair provides can reduce the risk of pressure sores and other conditions. Studies have proven that lift chairs function to support posture and maintain muscular tone due to the reduction of lower skeletal joint fatigue & degeneration. By raising the chair up the user is able to safely transfer on or off the chair from close to a standing position. This provides both a stable position to transfer from and greatly assists those with poor shoulder, arm or hand strength, instability or weak leg function. These chairs also offer an electric recline mechanism, including footboard raise, to provide exceptional comfort and promote circulation. 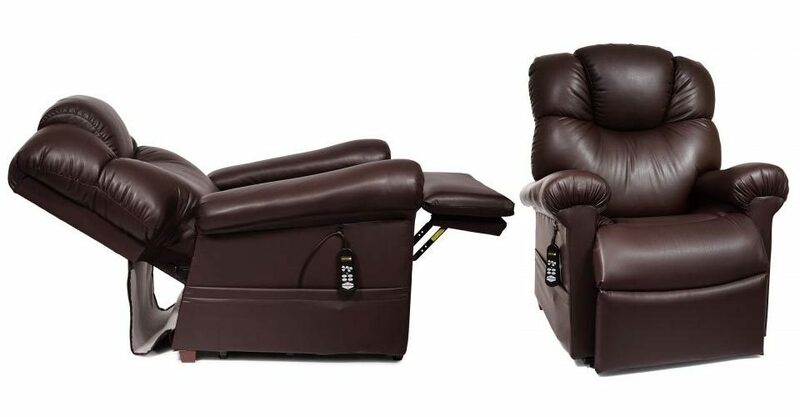 All lift chair recliners work on the same basic principle – you press a button on a hand control and the seat and arms (usually the whole chair) slowly raises you up so you can stand. The seat tips forward as well as going up, to help you get out. Sitting down goes the other way – you position yourself on the raised seat and press a button and the seat goes down slowly as you keep your hands on the arm rests. Reclining chairs are good because they let you get your feet up and lie back for a rest. You can also get yourself comfortable in different positions for different things, such as reading, eating, or watching television. If you are sitting down for long periods of time, a recliner is also useful because you can regularly adjust your position. For some medical problems affecting the legs, it helps to be able to lift your legs up when sitting. The leg rest should support the whole length of your leg. Some recliners let you lie back with your legs out straight. Some recliners go completely flat so you can sleep on them. Many professionals say it’s not a good idea to sleep in your chair for long periods, but there are specially designed lift chairs which are specially designed for comfortable sleeping. Tilting in space with a lift chair recliner can relieve pressure and soreness. The whole chair tips back – backrest, seat, leg rest and all. This means that the backrest still supports your lower back and that your weight is spread evenly through your whole seat and back. Power lift chairs are a simple and affordable accessory that can help seniors with mobility issues remain safe and comfortable as they age gracefully in their own home. No matter what your specific needs are, there is a lift chair for you.